Here's a sweet little gift card I made for a friend who is recovering from some major surgery. I used the My Creative Time Embossed Gift Card Holder with paper from DCWV's The Playtime Stack. My friend Kim made a super cute pocket card with this stack, which showed me how great it would work for the gift card die! You end up with a pattern for the outside and kraft for the inside! My embossed sentiment is from MCT's More Gift Card Sentiments. Isn't it such a pretty font? To decorate, I added a strip of pale green cardstock edged with the Martha Stewart Icicles Punch. 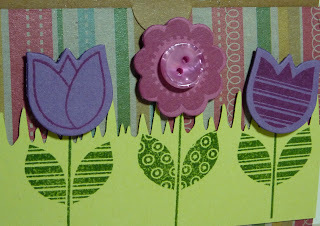 The flower stamps and dies are from Papertrey Ink. A pretty button on one finished it off. Very pretty card holder! Love the button! Very pretty - love the colors. What a very nice cheerful card. You are too SWEET! What a PERFECT way to use that stack! I am in LOVE with the flowers and that stack now! I need to go look at those tulip dies now! How clever are you with that punch too! As always ~ LOVE IT! I know your friend will too and wish her a full recovery! This will make her day! Lovely , really like the layers and the prints on the leaves, very nice !!! Wha a sweet card. I love the colors and that button center is th e perfect touch! 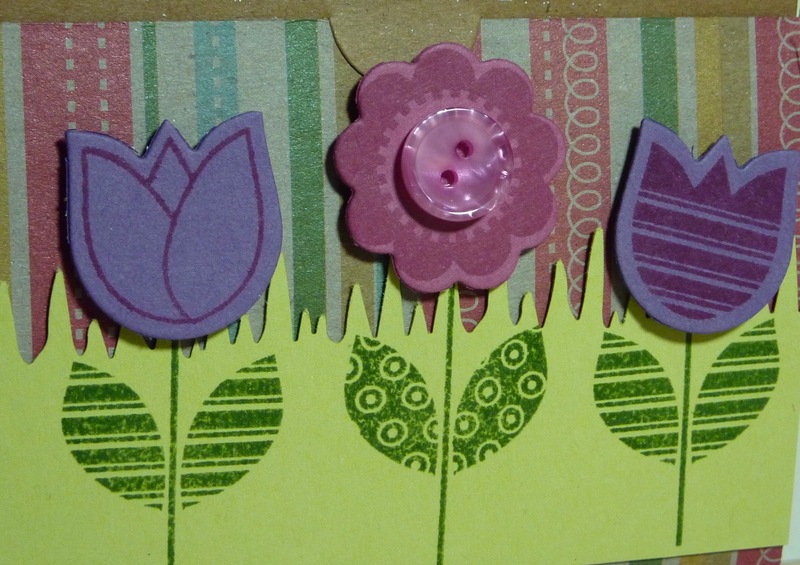 I really like this card and I'm thrilled that I have all of the supplies to make it, other than the paper! 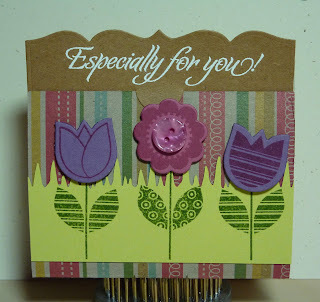 I really love the PTI Flower Fusion die/stamp sets and also the gift card holder and sentiments from Emma. Katie, you really have wonderful taste. More of your designs are saved in my "inspiration folder" than for any other person. Thank you so much for sharing. love it katie! yikes you're so organized, I haven't even stepped foot in my room to create! 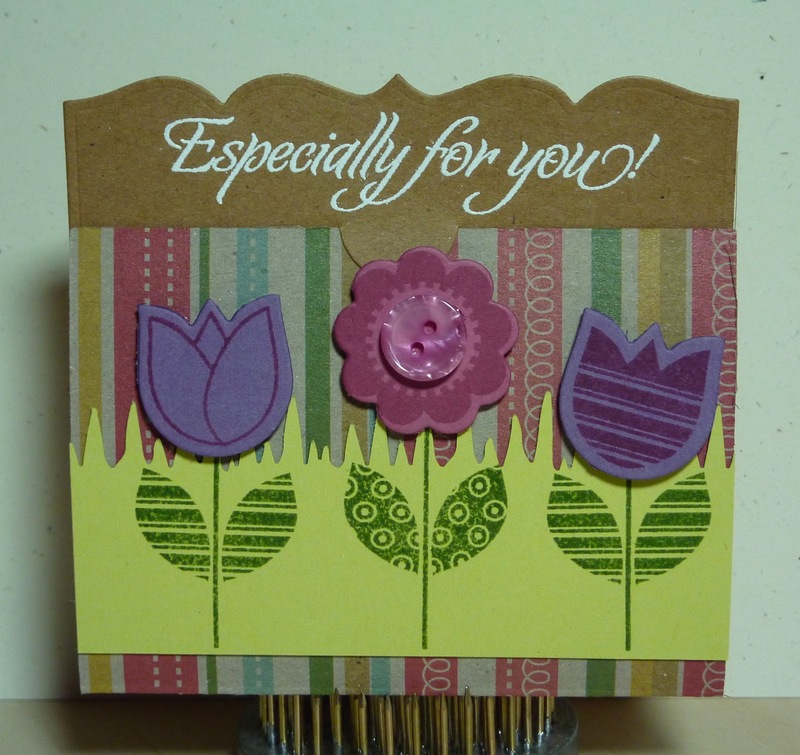 My Creative Time January Stamp Release Blog Hop! Birthday Tag with a Sneak!